Life is full of twists and turns, and you can never quite know just what's coming ahead of you. That's even truer when you're riding horses. Things can be going perfectly fine one moment, and then the next second you find yourself in trouble. That's just what happened to the rider in this video. The horse didn't quite feel like jumping the obstacle in front of it, instead choosing a much more unconventional route. 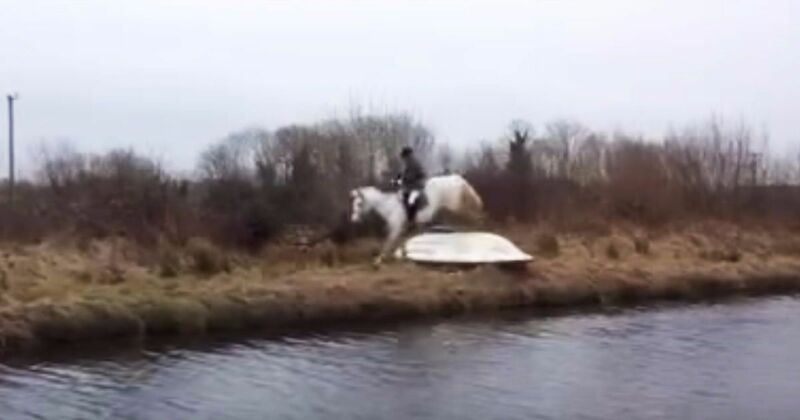 It's really par for the course when you're fox hunting, since you never know just how your horse will feel about the obstacles that come up before it. You can reduce the chance of a fall or run-out in the hunt field by preparing your horse well before you ever go hunting for the first time. Old North Bridge Hounds advises that your horse must be able to contend with a number of challenges in the hunt field, including crossing water, being comfortable around dogs, remaining under control in an open space and being crowded by other horses. It's a lot for any horse to take on, and that's why many hunt horses undergo rigorous training before they head out into the field. You can start your horse's training at home by making sure it is responsive to your aids, even when excited. Training your horse to jump over fences is an important part of teaching it to be a safe mount; you'll need to build up your horse's jumping skill slowly so that your horse has the confidence it needs to take on the solid fences you'll encounter during a hunt. When it comes time to head out to the hunt field, look for a smaller, more laid-back hunting opportunity so that you can expose your horse to the hunt field in a less-overwhelming situation. Take things slowly, and strive to build a quality foundation for your horse; it will pay off in years to come when you have a brave and honest mount to carry you through the hunt.